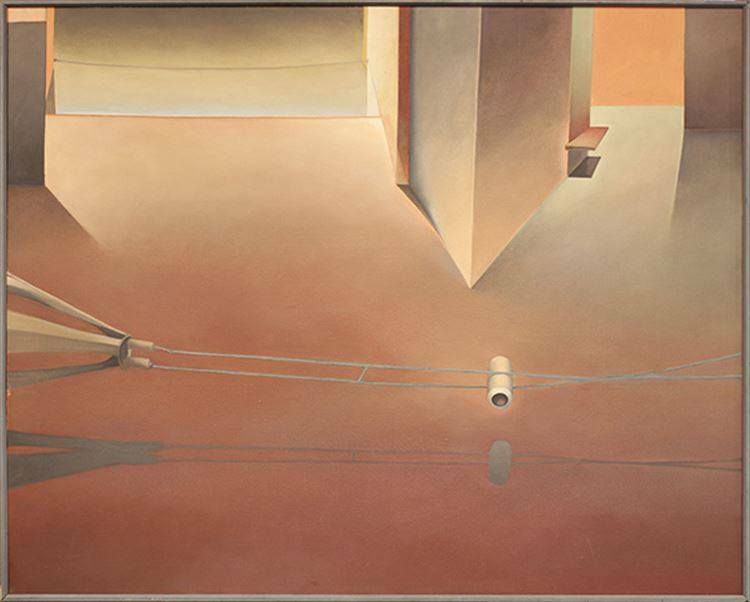 The painting titled “The Cable” by Chicago artist Linda Horsley-Nunley was executed when the artist was painting large interior spaces with machine-like parts (a feeling of largeness due to living in Chicago and working for Northwestern University Extension. The images came to Linda from being surrounded by her father’s metal pieces and machine parts which were left laying around in his engineering shop. The large interior space style continued even after the artist and her husband moved to Freetown, Sierra Leone. Presently, the artist’s passion is working with Figure and Cartoon images which lock together , still respecting the purity of shape but letting go of vastness of space around. Linda Horsley received her BFA from the University of Washington and MFA from Northwestern University where she taught Basic Design after graduation. As an artist/planner she organized exhibitions, commissioned ten public art pieces and created events including poetry readings, music and dance. She was a founding member of, and the Event and Exhibit Coordinator at, the City Museum in St. Louis. This museum also has the artist’s artwork in their exhibits. Horsley was also the Assistant Director for six years at the St. Louis Architecture Museum located within the City Museum. In 2002 Horsley published an Adult Fable book which she wrote and illustrated, Nature’s Play, presently limited edition available through author. ( contact in reply area ) She also illustrated a book for children Dancer, the Little Dog from Mayaro Beach, the story written by M. Gordon from Jamaica, published in 1991 in Trinidad and Tobago. She is a past member of Seattle’s Gallery110 Collective. She has also exhibited at the Burnley Gallery at the Art Institute in Seattle and at the Blackfish Gallery in Portland,Or. She has completed several art commissions for the Seattle Downtown Association that include Ponies on Parade and two Nutcracker March, plus a Pig sculpture for the Pike Place Market’s 100th Anniversary. She has been in four Camano Island/Stanwood exhibits entitled “Unclad,” and in exhibits in New York for Reflect Arts. Horsley has lived in West Africa, Trinidad and Tobago and has also traveled to many cities in Western Europe over a 30 year period. She currently lives in Seattle where she paints, writes and teaches. Linda is the proud mother of two sons, Avery James Nunley and Boyd Farris Nunley. Reblogged this on Surrealist Artworks.